While writing this blog post, I was drinking tieguanyin (a.k.a. Iron Goddess of Mercy), a soft, flavorful oolong tea. I brewed this cup for 3:00 using boiling water. I often do it with cooler water, but I’m feeling saucy today. Not saucy enough to add yak butter, but saucy nonetheless. In my not-so-humble opinion, the second infusion is better than the first. Last year at World Tea Expo (caution: that link autoplays video with sound) in Las Vegas, I attended a Tea Blogger’s Roundtable. It was a great opportunity to talk with some of the big tea bloggers, share experiences, and discuss challenges. 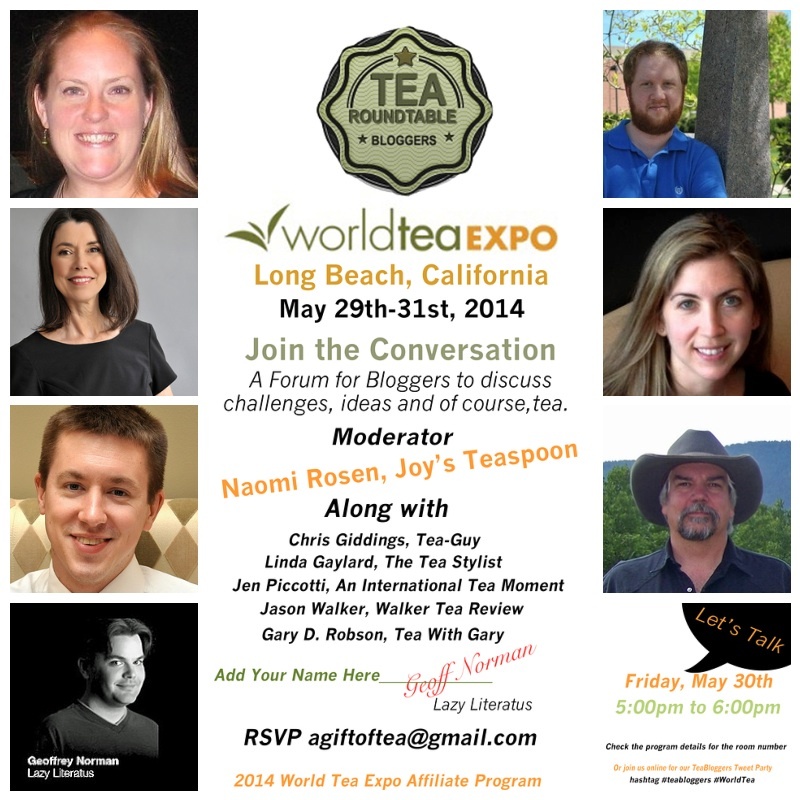 This year in Long Beach, California, I’m pleased to be one of the panelists. The panel will be on Friday, May 30th, starting at 5:00 p.m. Anyone registered for World Tea Expo or Healthy Beverage Expo is welcome to attend. If you can make it, please let us know using the email address in the poster above. Prepare questions for your favorite tea bloggers (and the ones you just tolerate, too). Take some time to check out the blogs before you attend, too. We all love getting new readers! See you there (except for Robert, unfortunately)! Deadlines: An Anthology of Horror and Dark Fiction. Even the title sends shivers down my spine. Somehow, this doesn’t seem to work for me. When I raised the question at the tea blogging roundtable at World Tea Expo last month, I couldn’t find a single serious tea blogger that blogged on a regular schedule. Why is that? According to the pundits, having a regular update schedule gives your readers something to look forward to. But what does a regular update schedule do to the quality of your blog? I understand deadlines in the magazine and newspaper business. I’ve been on both sides of those. And books. The editor needs to know when the manuscript will be complete to schedule copyediting and cover design and all of that other fun stuff. None of that, however, applies to a blog. In my humble opinion, a blog like this one can be badly damaged by the obsessive urge to post on a schedule. I do not presume here to speak for other bloggers. In fact, I would love to hear the opinions of other bloggers in my comments. Speaking just for myself, then, I believe that two things inspire good blog posts: inspiration and breaking news. Neither of those things is enough by itself. They both require passion and at least a smidgeon of writing skill. Neither of those things happens on a schedule. This gratuitous Twitter logo serves no purpose whatsoever except to remind you to follow me on Twitter. We now return you to your regularly scheduled — err, IRregularly scheduled — blog post. I may see something new and interesting while scanning a news site, tea blog, newsletter, or even Facebook or Twitter. What would be the appropriate reaction? (A) This is cool! I must let all of my readers know about this post haste while I’m still excited about it and it’s still news! (B) This is cool! I must put this on my schedule of things to write about. How does three weeks from Thursday sound? I don’t know about you, but for me writing it now produces a good blog post, and by the time three weeks from Thursday rolls around something else has caught my interest. Or what about the flipside? It’s blog update day. My deadline is coming at me like an enraged ROUS (that’s Rodent of Unusual Size for those of you who aren’t fans of The Princess Bride) with its tail on fire. I can’t think of a bloody thing to write about. I scratch out something marginally adequate, thus making my deadline. My dear readers say, “Gary’s certainly off his game lately, isn’t he? Mayhaps we should read Robert Godden instead. He’s not boring.” I’m having a hard time seeing the win in this scenario. I will continue, then, writing for my blogs when the spirit moves me or when I have something to write about. I really do try to get in about a post a week on this blog and two or three posts a month on my other blog. This is my sixth post this month on Tea With Gary. I think I’ll celebrate with a nice cup of pu-erh. Mind if I close with a little bit of xkcd? Of course you don’t. Unless you don’t like four-letter words. In that case, stop reading now. xkcd #874 by Randall Munroe. Click on the comic for the original. Then start clicking NEXT until you’ve caught up with the current one. Than go back and start at #1. I should have another blog post for you by then.